If you’re a DM who uses a battlemat, you’ve no doubt heard one or both of these names. For the uninitiated, vinyl battlemats such as those sold by Chessex provide a DM with a gridded surface on which they can draw whatever they need for their encounter or game. Wet-erase pens (of which Staedtler and Expo are two manufacturers), are used to draw on the mats and, as their name suggests, can be erased simply by wiping the surface clean with a little water and a paper towel. 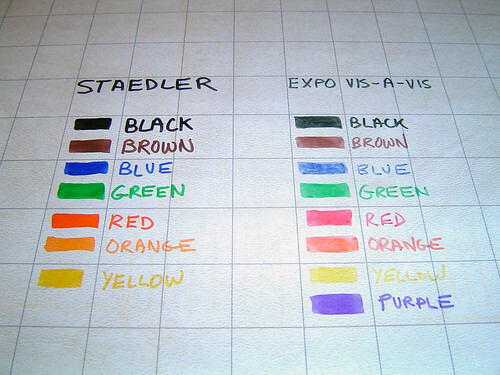 I’ve been using the Staedtler pens for many years now, and I wasn’t even aware that there was another manufacturer of wet-erase pens until I saw a Wizards.com forum member post that he preferred Expo’s Vis-à-Vis. I decided to give them a try. It should be noted that this was on a Chessex Battlemat and as such results may be different on other surfaces (such as GameMastery’s Flip-mats). This photo was taken with a flash to help highlight the differences in color and, more importantly, ink coverage. (For a more naturally lit comparison, see here and here). The most noticeable difference is the coverage of the ink (or the depth of the color, if you prefer). The Staedtler pens deliver a nice, even ink, whereas the Vis-à-Vis pens come up a little on the thin side. This is particularly noticeable in the black, brown, and blue, and also visible a bit in the red and orange. The Staedtler pens all have fairly true colors, though the red and yellow are a bit on the orange side. The verdict: Stick with Staedtler wet-erase pens, as they deliver a deep color with good coverage. Expo Vis-à-Vis pens, on the other hand, lack the fullness of the Staedtler pens, appearing thin and “watered down” on the mat, so to speak.